This post was co-authored by Lance of NewArchivist and Audra Eagle, author of the Touchable Archives blog, on which this post also appears. As the lines between libraries, archives, and museums continue to blur and professional identities become less and less concrete, a question arises on how to best foster collaboration and knowledge‐building between these sectors. In some regards, this question is even more profound for new professionals. In graduate school, there are opportunities to take classes in other disciplines or even specialize in multiple areas. Is this type of education actually bringing together the best of the theory and practice of these disciplines, or merely teaching library skills in one class and archives skills in another? Furthermore, it can be difficult for new professionals to know which of these identities belong to them. For example, what if you are a graduate of an archives program, working in a library setting, and putting together a few online and physical object exhibits? What are you? What professional organizations do you belong to and what journals do you read? Being new (and most likely carrying a mountain of education debt), we probably have to choose between the SAA, ALA, or AAM annual meetings. Where does one look to learn more about the issues and opportunities surrounding the convergence of libraries, archives, and museums? Is there something out there for new professionals interested in cross‐discipline topics and fostering collaboration? If not, what types of groups would suit our needs? The purpose of this post is to solicit answers to some of these questions. The Joint Committee on Archives, Libraries, and Museums (CALM) was established by the American Library Association (ALA) Executive Board in 1970 as a partnership between the Society of American Archivists (SAA) and ALA, with the American Association of Museums (AAM) joining in January 2003. An in‐depth history can be found on the ALA website. The committee consists of fifteen members, five from each organization, as well as three co‐chairs from each organization. 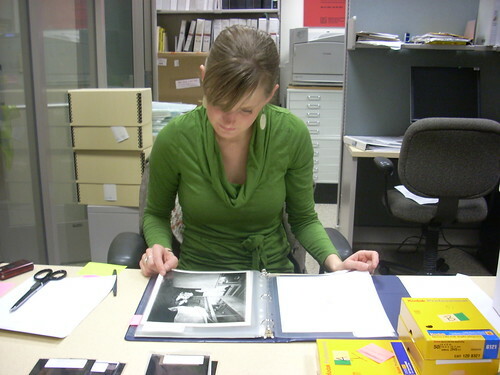 There are also staff liaisons and sometimes interns (mostly from ALAbut the committee is largely made up of experienced and well‐known archivists, librarians, and museum professionals. It is clear from the official functions of CALM that it is an administrative, high‐level committee that fosters communication between these three large organizations. (1) foster and develop ways and means of effecting closer cooperation among the organizations; (2) encourage the establishment of common standards; (3) undertake such activities as are assigned to the committee by one or more of its parent bodies; (4) initiate programs of a relevant and timely nature at the annual meetings of one or more parent bodies either through direct Combined Committee sponsorship or by forwarding particular program plans to the appropriate unit or on or more parent bodies for action; and (5) refer matters of concern to appropriate units of one or more of the parent bodies. Both of us had never heard of CALM as graduate students. It was not until Audra was selected to be a part of the 2009 class of ALA Emerging Leaders that she was introduced to the committee and its priorities. (In case you’re curious, the 2008 EL class created a wiki for LAM (libraries, archives, and museums)‐related issues, which the 2009 EL class updated and supplemented with a del.icio.us page, and the 2010 EL class is working on a podcast series for LAM‐related issues.) CALM was born as a policy‐based group of representatives from SAA, AAM, and ALA. Their willingness to work with ALA’s Emerging Leaders program seems to demonstrate an interest in the ideas of early‐career professionals. There is potential for CALM to become a major vehicle for encouraging discussion and scholarship about LAM convergence. The OCLC‐related hangingtogether blog as well as the new IMLSUpNext wiki present opportunities for discussion and debate around LAM issues. So other than getting involved with the big OCLC working groups and the super‐committee known as CALM, what opportunities are there for early‐career librarians, archivists, and museum professionals to be a part of the convergence of libraries, archives, and museums? Where is the “Emerging Leaders” program for new/young professionals who think and work between the LAMs? Convergence is an exciting thing. How does this generation of new professionals understand and interact with it? That is what we are asking you. When we were first discussing this idea, we thought that an informal type of group focusing on these issues would be a good start. Perhaps it could have an online access component to foster collaboration and not require travel. We need your help and ideas on filling out this idea and make it into something tangible and usable for us new information professionals. Please leave comments or email us at lam_ideas@newarchivist.com to let us know what you think! Feeling Inadequate? You’re Not Alone! We are excited to have Bria Parker as a guest contributor this week. Bria has a Master of Science in Information and works for a large academic library in the Midwest. She is also the first New Librarian to contribute to our site (we are so inclusive). I think this post is something that a lot of us new information professionals are grappling with and will spark some great comments, so please feel free to add yours. Thanks for the awesome post, Bria! ~ Ed. If you’re like me, you were required to take some sort of management course in Library School (Information School, Archives School, whatever). And if you’re like me, much of it seemed like a spectacular waste of time, because really, how many of us are managing a department or institution right out of grad school? Oh you are? How nice for you. You can stop reading now. Sure, sure, we’ve all had jobs before now in which we were managed, but when it comes to the professional world of libraries and archives, how do us neophytes operate in the pre-existing hierarchy that is [insert institution here]. We are now professionals, too, so how do we assert our thoughts and ideas when we disagree? What happens when you disagree with how things are done? Or about the way things are about to be done? What happens when you disagree so strongly that maintaining the status quo compromises your belief in what’s right? What can you say? What is the appropriate action? How could anyone get so worked up about old stuff? If you’re a New Archivist, it is likely that you are currently facing this dilemma, or will soon. How does a new archivist (or librarian) balance the feeling that you might know more about a particular aspect than your superior(s) (either the particular aspect in question is your specialty, or you’ve studied it more recently than others) with the feeling that perhaps you’re just too naive to really understand the bigger issue. I was recently faced with this exact issue, and it broke my confidence. For months others and I had planned and planned, and had developed reasonable specifications. I felt like the research I had done, and all of my previous study really prepared me, and that the right path was chosen for the project at hand. Then someone stuck a stick in our spokes. “No. We aren’t doing that.” Umm…what? Had I been completely wrong? Where was this coming from? Do others not trust me? Am I too stupid to see something? Unfortunately, a management class and group projects with peers did nothing to prepare me for such a crisis of faith in myself, nearly buckling to the decrees of others whom I felt did not truly understand the issue (despite us having talked about it for months). The situation that brought on this rant has been resolved (thankfully) in a manner that did not require me to give up much ground (the compromise was a true compromise, with both sides giving a little). My colleagues and I were able to successfully defend the decisions and choices that were being questioned by others. No feathers were ruffled and nothing was as confrontational as the email exchanges leading up the successful meeting had indicated. This is a good thing. Yet while I leave this situation feeling that yes, my knowledge and training did prove to be correct, I was not really able to address the feeling of naivete and inadequacy that plagued me during the two weeks this went on. I was never able to resolve to myself whether or not one of the issues was that I just didn’t get the big picture. Ultimately, this has been a great learning process for me, and no class would have prepared me for this lesson. But I’d like to know some of your experiences and seek your wisdom. In the future, what should one do? How can one manage the dichotomy of knowledge versus naivete? What if this hadn’t come to a peaceful solution? Should I have stood my ground and possibly made a bad impression? Or should I have buckled to their collective will? Enlighten me, New Archivists!